The overriding purpose of our business is to empower land based fleets with a higher level of safety and efficiency on the road. This benefit naturally extends to private vehicle operators also sharing our highways and biways. Create custom synergistic safety solutions for OEM products that perform functionally and aesthetically, complimenting the vehicle. Build-in serviceability for lifetime products people can easily work with in the real world. No more disposable mirrors! Minimize re-engineering at user-level. Upgrades fit on exsisting chassis/hardware and hole patterns. Do it right here at home. 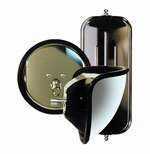 Mirror Lite Products are Designed, manufactured and Assembled in the USA. Invest in America. Over 90% of our vendors and suppliers are US companies. Value every customer as a vital industry entity and respect them as a company of human individuals. Happily provide whatever support the customer may need to get the most benefit out of the product. Maintain an attitude of openess and cooperation in the industry.